Highlight the contour of your garden with the star-shaped or designed shaped pattern solar lights and go on a romantic date with your partner. Whether it’s finding the garden pathway or lighting your homes, these solar outdoor lights are all set to beautify your home decor. The bright and white lights cast by the solar lights will away your intruders. Imagine living in a place, surrounded by dark-dense woods and with no outside lighting. That’s when you can trust solar lights that will stick to your side no matter what. Finding the solar light becomes much easier when you know what are the things you want in the solar light. You can be baffled with the huge availability of the Solar Garden Lights and choosing the right one can be tiresome. Before we proceed on to reviews, here’s our buying guide to solar light that’s much informative. Brightness: Lighting up your garden or front entrance is your sole purpose of buying solar lights. Always for the solar lights that cast bright and consistent light for the clear and transparent view. 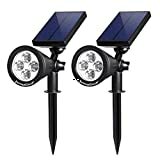 There is an abundance of solar lights that come with the lighting settings. Water-Resistance: Since the weather is unpredictable and you will have to mount these lights outside, there is a high probability of these lights to come in contact with water. Rain or water droplets might get inside the device causing it to malfunction. So, go for the lights that are resistive to water. Adjustable Solar and Light Panel: Modern Solar Outdoor Lights come with the adjustable solar and light panel. These panels can be adjusted according to the sun rays for providing maximum exposure with the sun. This will charge the solar lights quickly and provide the long-lasting light that can run through the entire night. Solar Outdoor Lights have ousted the contemporary electric bulbs. Despite being eco-friendly, these solar lights are economical and can be a big comfort when it comes to electricity bills. However, it becomes so difficult to know what, exactly Solar Powered Lights serve us when there are the plethora of options. Our continuous hard word will escape you from this situation. By the end of the article, you will definitely get to know what exactly you. This Solar Powered light brags about the 2 in 1 installation. You can either mount it on the wall or set it up on the ground without any wire. The device features the auto power on and off which turns on the device during the dusk and turns off the light during the dawn. In additions, these lights are waterproof and heatproof that ensure the durability of the product. The Solar Outdoor Light is much easy to set up. Moreover, the device is completely wireless and you can easily mount it on the wall or set up on the ground. The device produces much warm, bright and consistent lightening. The device is not soo waterproof which is just in contrary with what the company had said. Moreover, the durability of the product can be a bit skeptical. The device does not retain the power for long, that’s really disappointing. Final Opinion: Overall, I am much impressed by the performance of this Outdoor Solar light. The device lights up the garden path beautifully and allows me to have a stroll. So, I will stick to the product since it saves a lot of money for me as well. The Solar Powered Light comes with the 6 lights that are the star-shaped making your garden path more elegant than before. The easy installation takes up no time to bring this solar light in use. Coming to the durability, this outdoor solar light features 6 metal stakes that are unbreakable. The solar-powered light emits out the bright light that seems much pretty to walk through the garden aisles. In addition, the customer- support has been amazing. They were constantly in touch until I felt satisfied. The star-pattern looked absolutely stunning and elegant. Their lightening does not last long when they are fully charged and the durability of the product can be doubtful. Final Conclusion: While I was mentioning the cons, they didn’t really matter to me. Since there is a great customer support, I did not have to bother about the durability of the product. I know that how firmly they stand up behind the quality of their product. Enlighten your garden with 2 times more brightness with the Solar Garden Light. With no wiring procedure involved, you can easily set up the solar light. Being waterproof, the outdoor solar light can withstand any weather from sunny days to the rainstorm. Never run out of the power again. The bright lightning effects it emits out looks so elegant. The price tag is really affordable and that makes absolute sense to purchase the product. The Outdoor Solar Light is made up of plastic that does not live for too long. So, the durability and longevity can’t live up to your expectations. Final Conclusion: Overall, this is a budget-friendly Outdoor Solar Light so you can’t expect more out of this. Still, this device serves its basic purpose and cast a bright light to lighten your garden. If you are looking for a solar light within your budget, this might be a good choice. 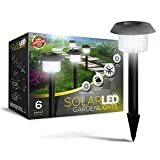 This outdoor Solar Landscape Light features the adjustable solar and light panel so that you can adjust them for the maximum exposure to the sun. Being water resistant, the device can withstand any sort of weather to cast bright and white light. Like all premium models, the Solar Landscape Light features auto off and auto on. This Solar Landscape Light casts a bright, white light to illuminate your garden. The lights are capable of running through the entire night and auto turn off feature automatically turns off the lights during the dawn. The adjustable solar and light panel allows you to easily adjust them for the maximum absorption of sunrays. Sometimes, the rain and the water droplets can cause a defect in the functioning of the light despite being water-resistive. The durability of the product is not reliable since the plastic can brittle after some months of usage. Final Conclusion: I found this outdoor solar light worth the investment. Featuring the flexible solar and light panel, this device can quickly charge and lights up your house for the entire night and that’s pretty nicest thing about this product. I was going to stick around this product, anyways. 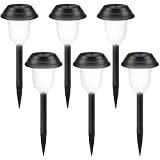 lluminate your front entrance way with the SolarGlow Solar Garden Lights. The set of 6 LED lights will evoke a sense of admiration while strolling through the garden pathway. The auto turn on and off features will turn the device on at dusk and off the device during the dawn. Experience the hassle-free installation without wiring. This Solar Garden Light casts an illuminating bright, warm and white light which really last long and you will never run out of power. Beautiful appearance with a classy finish. The plastic components can cause little more of a trouble. Final Conclusion: The lifetime warranty offered by the brand justifies the quality of the product. In case, if any defect emerges out from the product, the company will either repair it or replace it. So, I am not at all bit concerned about the cons and find it worth the investment. No more darkness with the Hallomall 200 Lumens Adjustable Solar Outdoor Wall Lights. The device features an adjustable solar panel for the maximum exposure with the sun. The device charges up instantly under the powerful heat of the sun. Besides this, you need not to worry about the unpredictable weather. It can withstand any sort of weather giving you a bright, white light. Adjustable solar panel absorbs most of the sun’s heat and instantly charges. Auto turns off feature shuts the device during the dawn. Easy to install and takes no time to set up. Lights get dimmed after a certain period of age. The build quality is fragile and unreliable. Final Conclusion: This is the budget-friendly Solar Light which comes with so many premium features. You can’t expect everything under this price. Even though it comes with an adjustable solar panel for the maximum absorption of the sun’s heat and this is really the nicest touch given to the device keeping the price tag in mind. Our next pick in the best Solar Garden Lights is this device. The motion sensor automatically senses the motion and turn on the lights. The 28 powerful LED lights are all set to convert your dark yard into the bright one. Being resistive to water and heat, the device is capable enough to suffer the assault of each weather. This solar outdoor light casts brighter light and saves energy. Detects motion within 3-5 m and turns on the lights automatically. The durability and build quality is a matter of concern. The device works fine when kept under the direct sunlight of the sun. Final Conclusion: Overall, the performance of this device is quite satisfactory. This device is enough capable to resist water or heat. You can expect no problem in the lighting of the device. They can provide enough lighting to run through the entire night once charged properly. The device features three easy mounting as per your requirements. In addition, the device is capable enough to cast the light for 10 hours which means, it can easily pass the night. 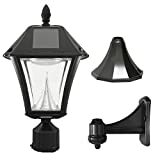 Besides this, the Solar Outdoor Lamp comes with the auto turn off and on feature to shut down the device at dawn and switches it on during the dusk. Easy Install with 3 different mountings. The device does not cast much brighter light as expected. Another disappointing thing is its build quality that is much doubtful. Final Conclusion: Overall, we are content with the performance of the outdoor solar lamps and I found out that the build quality could be good. The device is made up of plastic which does not at all ensures the durability. With the price factor, we somehow, have to make compromises with the features or with the build quality. 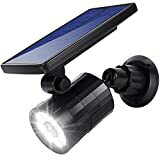 This outdoor Solar Light takes pride in the adjustable Solar and Light panel that can be rotated up to 180 degrees for the complete exposure with the sun. The 2 in 1 easy mounting allows you to either install the lights on the wall or on the ground. Like every other device, it features the auto turn on/ off. Easy to install. You can either mount it on the wall or set up on the ground. Adjustable solar and light panel up to 180 degrees. The lights do not last long as expected and the build quality could be better. Final Conclusion: To be honest, the solar light works well when it comes to the price level. This is another budget-friendly device you can get if you are budget-specific. Overall, we are content by the performance of this product. This was the list of best solar powered lights that are available in the market. These solar lights serve more than just lighting your garden or yard. 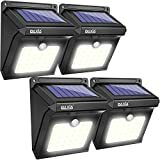 So, if you are on a lookout for the top outdoor solar lights, our reviews of the products will go too far to help you in making the right move. All we want is that you get the solar light that best meets your specifications. 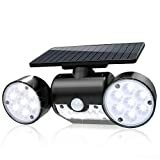 Now, you know these outdoor solar lights considerably differs from each other in terms of performance, budget, features. Your search for the best solar garden light will definitely end here.